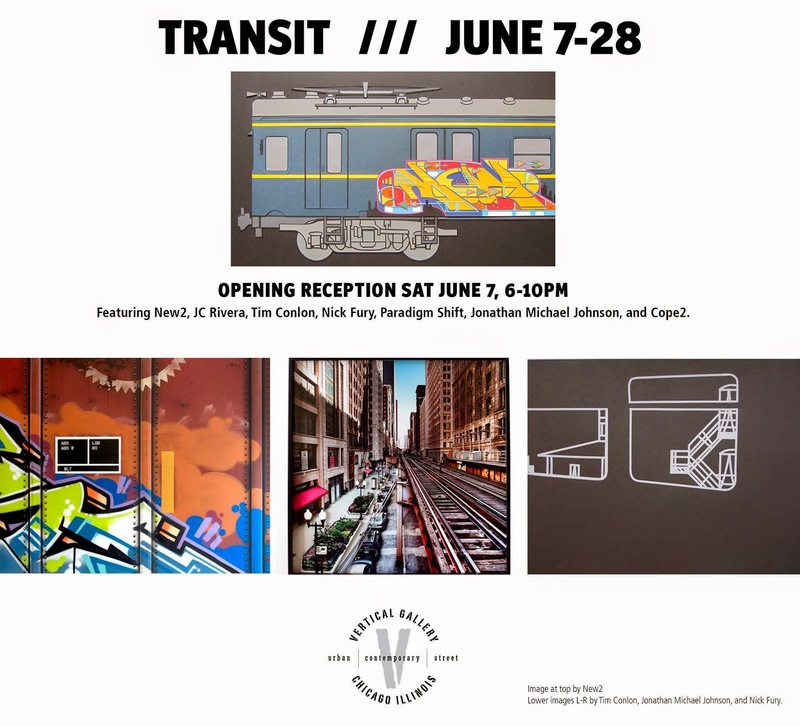 Vertical Gallery is proud to present TRANSIT, a group art show about trains, subways & bridges featuring New2, JC Rivera, Tim Conlon, Nick Fury, Paradigm Shift, Jonathan Michael Johnson, and Cope2. The exhibition is June 7 - 28, 2014 with an opening reception on Saturday, June 7, 6-10 PM. For this exhibition, the gallery selected artists who use a wide range of mediums including paper collage, glass making, photography, painting, found objects, mixed-media, model trains, and more. gain recognition outside of Australia and has exhibited in both group and solo shows in Australia, United States and Europe. Washington, DC based Tim Conlon was featured and curated the G scale train exhibit in the Los Angeles Museum of Contemporary Art’s, Art in The Streets survey of graffiti and street art. Conlon will bring his famous model trains and large-format paintings to the exhibition. New York City artist Cope2 crosses between the art world, mainstream and street culture alike. One of New York City's most legendary prolific graffiti artists, he began tagging his name in the South Bronx since 1978. Cope2 brings his raw energy into abstract masterpieces, intertwined with his trademark bubble letters and tags on subway maps. Chicago artists JC Rivera, Nick Fury, Paradigm Shift, and Jonathan Michael Johnson all bring unexpected new work to TRANSIT. JC Rivera, most known for his vinyl toys, brings a brand new concept with a collection of train paintings. Nick Fury bases all of his work on CTA (Chicago Transit Authority) experiences. Using white-out tape on paper, he has created a new collection of CTA disaster scenes that must be seen. Paradigm Shift ignores the line between Fine Art and Craft that people associate with glass. His sculptures will immediately change your perception. Photographer Jonathan Michael Johnson has been experimenting with new techniques that challenge the photographic print medium. He has deconstructed and reconstructed images to bring a new multi-layered effect. This will be his first time showing this new work.